Halloween – I’m thinking pumpkins, candy, costumes, horror movies and ghost stories…and in Sweden, we have none of that *sigh*. But, I’m not gonna let that ruin the fun. Are you looking for something to read for the holiday? 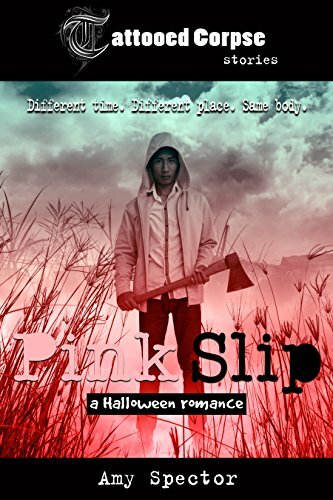 Pink Slip by Amy Spector is a rather short romance story that takes you on a wild ride through the corn maze. It’s the first release in a short story series called The Tattooed Corpse Stories. The tagline to the series is: Different Time. Different Place. Same Body. And that’s what the series is – stories taking place anywhere, at any time, with different characters, but with the same recurring body. And I’ve written one… It’s coming soon. But, back to Pink Slip! Someone really should write a manual about what to do when coming across a dead guy. I mean there are so many options and then there is one thing that you definitely shouldn’t do – that’s the thing Jackson Winter and Tae Min Reese do. This story had me laughing so many times. It’s sweet, it’s funny, and it has a few Wait? What? moments where you wish you reach into the story and tell them that they really shouldn’t do that LOL. I loved that it took place, partly, in a corn maze. I’ve never been to/in one but it seems so cool. I was imagining the maze scene in Harry Potter and the Goblet of Fire but with corn instead. Jackson Winter loves everything Halloween. He loves the weather, he loves horror movies and he loves his job at Hoffman Farm and Dairy’s yearly Trail of Terror. Now he thinks he just might be falling in love with the trail’s newest special effects artist, Tae Min Reese. Tae is a disappointment all around. He’s not a doctor like his brother, he’s an art school dropout, and he has no interest in making his mother any grandbabies. Now it even looks like he’s going to lose his job at a second-rate, haunted farm. And he’s not even sure why. When Tae decides he needs to break the bad news to the good-looking zombie actor who makes up any excuse to see him, a chance encounter gives them both something else to worry about. Now, two angry drunks, a stinky car, and a dead body could ruin Halloween for Jackson forever. Or could it mean a happy ending for them both?